Select and read your book (this is the easy part!). Be sure to choose a book you truly enjoy--it will make this project that much more fun! Remember, you are creating a "mini-commerical" to get others to want to read your book, so your enthusiasm will shine through! Click on the Media Center image to the left to search our media center for book titles. Watch (and critique) other book trailers. Be sure to pay attention to things like background music, pacing, voiceovers, content, images—intriguing? Confusing? Click on the image to the left to view some trailers (these are mostly elementary books, but I chose this site because I thought then you would maybe find titles you were already familiar with, to help you understand what elements from a plot should be included). You also can simply search on "award winning young adult book trailers" or "childrens book trailer winner" etc. to view more. ​Here is one that I made--simple, just text (no talking) and images and one song. Decide on the tools you are using: to storyboard, to write and save your script, to collect images, and to create the video. If you use WebNet, then you can construct and save all of these elements in OneDrive, which will allow you to continue to work on them at home. This means that you will be using OneDrive, Microsoft Word, and Microsoft Powerpoint. To stay orgazined, begin by creating a new folder in OneDrive and labeling it "Book Trailer." You can then put your script (in word) and your images as well as audio sound effects and music into this folder, along with your final book trailer video. Write your script. A book trailer should NOT be more than two minutes long (really, 30, 60, or 90 seconds is standard). Check with your teacher for the preferred length. Whatever the case, you need to be mindful of how much to include in your trailer. What is the main conflict of the novel? Who is the main character? How can you entice readers, yet not give too much away? Remember what you liked--and did NOT like--about the book trailers you ha ve viewed. If you click on the image above, you can find a good sample of how to write a trailer script. This happens to be for an adult novel, but is a great guideline to folllow with good suggestions on what to include (and what to leave out). ​​Search for images to accompany your script using the websearch links provided below. You CANNOT simply grab any image off the internet--that would likely result in copyright violations! As you find your images, unless they are in the public domain (and therefore copyright free), be sure to note the required attribution information (creative commons licensed images still often require attribution). Copy and keep the URL of the photo and and photographer's name or username (this will need to appear at the end of your trailer). Another option? Take your own photos or video--but be sure the quality is very good. Speaking of quality....when searching for images, you want high quality resolution--look for 1280 by 720 or larger if possible (you can use filters or advanced search to find such resoutions). This will help your pictures to be sharp rather than blurry and result in a high quality finished product. Think about your search terms--do not be too specific when doing an image search (most images do not have an abundance of tags). For example, "sad man" may yield better results than "crying old man with gray hair and blue eyes." When thinking about number of images, a guidline is a short sentence could have one corresponding image; a long sentence should have no more than three images. KEEP TRACK of your photos and their source/attribution! Save all photos into a folder in OneDrive. Use Microsoft Word to correctly cite your image sources if needed. It's FINALLY time to start on your Book Trailer video! You will be using Microsoft Powerpoint to create your trailer. 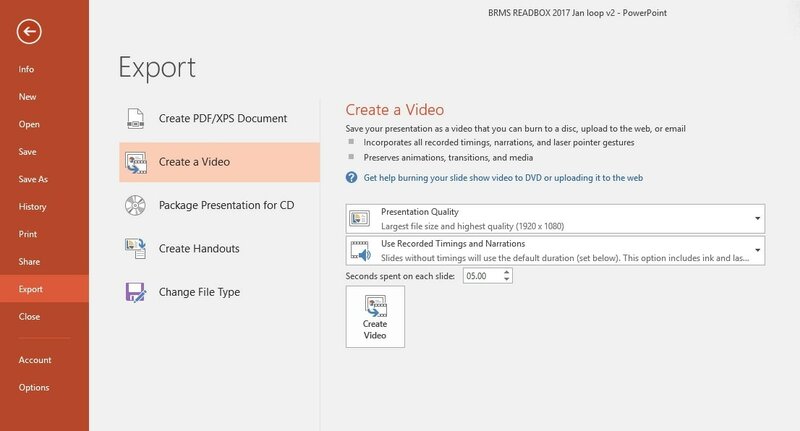 YES, you can add images, video, sound and voice over recording to powerpoint. All the basics are there to create a great book trailer. And, because sometimes, there is no need to reinvent the wheel, you can check out the blog site below for truly step-byb-step directions as well as screen shots for working on your trailer in Powerpoint. Free-to-use audio tracks. Most require attribution. High quality, free-to-use audio tracks. Most require attribution. How should I give attribution in a project? If it is in the "Public Domain" then no credit is required. Creative Commons licensed content requires giving appropriate credit unless it is CC0. You need to include what is called "Attribution,” which means giving credit to the creator of the work. Music: "Tra-la-la" by Podington Bear From the Free Music Archive CC BY NC (these last few capital letters are the type of Creative Commons license. You should see those on the file where you got the image, sound, or video) also include the URL. 6) Eventually, you will see the file is now saved as an .mp4 not a .ppt. It can then be shared like a video clip! "Life is a classroom -- only those who are willing to be lifelong learners will move to the head of the class." Zig Ziglar, motivational speaker and author of See You at the Top.